The answer to last week’s challenge is. 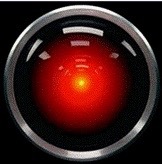 Q: HAL 2000 is the name is the name of the famous super-computer featured in the movie “2001: A Space Odyssey”. There is a curious relationship between HAL and the computer manufacturing company IBM. Can you describe it? A: HAL represent the letters that immediately precede IBM in the alphabet. This week’s lateral thinking challenge is. 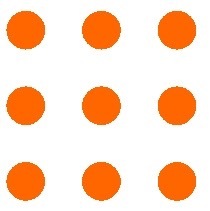 Q: In the diagram below, link all 9 dots using no more than 4 straight lines without lifting the pen off the paper and without tracing the same line. The answer along with a new challenge, next week. Frank Connolly is the Principal of “Think Quick”, a business that adds value through thinking differently. His work history covers all sectors and includes initiatives that have yielded bottom line benefit in the 10’s of millions of dollars. Current clients range from Exxon-Mobil to Government Depts within Australia to Global NGO’s. Much of his working life has been split between Australia, the South Pacific and Asia where he has trained and facilitated Lateral Thinking techniques, and been acknowledged by Edward de Bono as one of the foremost practitioners of the de Bono thinking methods worldwide. Frank believes strongly that if we can improve the way we think, the actions that follow also improve.